The bags are good but could be offered with an option for a odour guard/protection for blocking out odours and also other colour option's. Good quality, strong bin liners and fits the bin perfectly. I wouldn't use any other bin liners. Being a Virgo I like things to be neat and tidy, so it makes sense to have the right liner for one's bin. The Simple Human liners are perfect and very strong too. 10/10. I have bought your trash can,trash bags,soap pumps and shower caddie.i rate all of these products 5 stars. Ok, who really thinks about trash can liners? We love our simple human trash can and the bags that came with it. But once the sample bags ran out, we just used the regular trash bags from the store to save a little money. Now we know why you should buy the custom fit liners designed for the trash can--there is no comparison as to fit and capacity between the two. Simple human bags are great, and you get a great number of bags in a multipack. Spring for the good bags, and you will enjoy your trash can more. Save the cheap bags to just collect litter. Highly recommend these trash bags. Love my trash can. Love Love Love these bags. I used to purchase so many bags till I got these. They hold so much and never ever burst. My husband is in trash heaven!super cost effective! It's hard to get too passionate about bin liners but as these go, these are the tops. Very good quality, good fit and the dispensing system is great. Cannot live without my simplehuman trash container. The absolute best liners I have ever used! Fits perfectly with my Simple Human trash can, never slides out of place, and holds more than I expected. Strong and durable. Le sac poubelle par excellence. love the whole Simplehuman trash can unit. Only regret is that I didn't purchase this system earlier! The liners fit great, they are super strong and actually save you money in the long run. I can't say enough good things about the super strong trash bags that go into the 45L trash can. The can is perfect size fitting up nicely to my cabinets and the bags are strong with out a problem with leaking or smells. I can fill this right up to the top without a problem. Well worth the money. Well worth the cost. Liners fit well, and are sturdy. Excellent - so neat and tidy, so pleased I was persuaded to buy the kitchen bin - it is so functional and doesn't look an eyesore, and the bags fit so easily and neatly - excellent. Ich habe lange danach gesucht! Nicht nur die Müllbeutel passen genau auch die Mülleimer ist für uns perfekt! I've always bought bargain brand liners thinking it didn’t really matter. When I bought my new trash can it came with several fitted liners. I loved them so much I now buy them online. The few dollars extra they may cost is worth having a liner that is durable and fits. Have the Simple Human trash can. LOVE, love, love this trash can and plan on having it for a very long time. Sooo, I bought a ton of trash bags and the price was great, the delivery was great. Very happy with it all!! Sacs de très bonne qualité et qui s'adaptent parfaitement à la poubelle. Used to use those plastic grocery bags. No cost. Convenient enough. No more. We use one of their cans with the fitted liner, and the convenience beats any added expense. The fact that their liners are over-long means you can cram the trash can full, and yet when you pull the bag it all shakes down enough to easily close the bag. The pull strings almost never break, either. Wonderful stuff. Terrific. Fit perfectly. I really like that they are store in the back and I can pull a new one out inside. The exterior is beautiful and stays that way with simple wiping. Great product. The best trash bags I have ever purchased. Same for the the stainless steel kitchen trash can. Love them both, well worth the money! As my order should have been for code K bin liners, which were subsequently sent through, I cannot comment on code M liners. I will say that the code K liners are brilliant and seem to hold a whole week's worth of kitchen rubbish - amazing; they are strong, well packed, easy to use and fit the bin perfectly. I will definitely re-order in due course. I LOVE the way they fit perfectly no over hang. Very strong. quality is great, price is a little high, but you are paying a premium for a higher quality product. No fiddling with trying to make a bin bag fit the bin, no tearing when you try to lift it out, no leaking all over the place, no splitting...... etc etc. and they look great in the bin with no overhang. Worth every penny/cent/euro to have them shipped to France although Im slightly guilty about the environment miles. But I just love them! Im a terrible person. Like these liners! They handily fit into the back pocket of my can and are easy to access. The size is perfect as well. These bags are brilliant they fit perfectly and good quality. They may be a bit more expensive but you get what you pay for. Love, love, love my Simple Human products. My first purchase was the pet food container and I can't say enough about the quality and convenience of this stainless steel beauty. I also have two stainless steel trash cans that are very attractive. May I suggest a stainless steel container for Clorox wet wipes for the counter top? I've been searching for one and am surprised Simple Human has not made one yet. Buy Simple Human products people. You will not be disappointed! These bags fit wonderfully and never leak. I love the good quality, and won't buy anything else again! The bags are very strong. Price is more than standard bags but still a great value. I must say that I wasn't sold on the custom fit bags when I saw the price, however they do fit perfectly! The price is better when purchased in bulk. I bought the rectangular bin (also from Simplehuman) that holds the bags inside the back of the bin itself. The bin itself, though over £100, is absolutely one of, if not the, best 'gadget' I've ever bought! The bags are then even better than my expectations. They fit like a glove with no overhang and are really strong and sturdy. Even though the bin - and bags - have half as much capacity again as any of my previous bins, these are the first bin liners that just pull out easily by the handles with both the handles and the bag strong enough to stay totally intact! Genius! A product specialist has reached out to you to further assist you. The first time I purchased Code M bin liners (about 2 years ago), they felt crisp and strong, and never punctured ot tore under stress. The last 2 purchases have felt like inferior quality liners; softer, less robust-feeling plastic, which often rips and tears in use. My daughter uses the same bin, but purchases her 40 litre bin liners from Asda, for less than one quarter the price; she says they work fine for what she wants. I am going to try them myself next time. When buying a premium product, I don't mind paying a premium price if the quality is there. Currently it feels as if Simple Human have outsourced the manufacture of these liners to a different supplier for purely cost reasons, and the customer is left with an inferior product whilst the company increase its profit. In my book the customer is more important than the shareholder every time. A member of our customer service team has contacted you directly. These do exactly what they are supposed to and are better value than buying from the high street retailers. How could we live without your garbage can liners! OMG! Can you imagine a life without Simple Human garbage can liners created for each of the lovely garbage can designs they have created? It's SOOOOO easy to pull out the full liner and replace with the custom fitted bag? No need to save other plastic bags (that's a NO-NO! ), purchase separate black plastic jobs from another manufacturer! Can you just imagine how great it feels to head to the dumpster and see that you have the only lovely Simple Human bag liner and it is clean, tied tightly closed and your garbage isn't running over everyone else's? THAT makes for a lovely day when your garbage bag makes a social statement. Keep up the good work! I mean, my gawd, isn't it worth a few cents every day just to have designer garbage liner bags? We agree! Thanks for the great review. Glad you love the liners and how functional they are! What is not to like? They fit well, and hold up well! Couldn't believe I spent this much on these liners, but they are the best. The coupon was the big incentive. Love the way it hides the liner, and the garbage can, itself, is clearly great. About a month ago I called to order liners for my trash can. I spoke to someone who apparently was in a bad mode or was just plain rude. I wanted to double check the reorder number on the liners I needed. Instead of just answering my question and placing the order he felt it was necessary to tell me I was pretty stupid because I needed to confirm the code. I was shocked by this persons lack of customer service skills and left a comment after hanging up and placing my order on line. My answer was basically to bad at least you got your product after ordering on line. Great product, terrible customer service. simplehuman does the thinking for us when they offer products. We know what size we need (M for me), the price is right ( same as stores), no agony about getting the bag into the can, and it comes to our mailbox quickly. We don't go to stores and find the right section and look over all those choices and make a selection we hope is right. Oh yeah, and the bags don't rip when you use them. Amazing!! great fit, durable and never a mess! I was so disappointed to find out that your M bags are now larger and not a great fit for our kitchen waste basket. My first order was huge and the bags fit great! This last order was not good! I might as well just get bags from the grocery store. These just keep slipping down. I won't be buying more from you. Wasn't sure these liners would be worth the extra cost over regular old grocery store bought liners, but I was wrong. After years of struggling to get liners to fit properly on our trash cans, I now have liners that go on the can with ease and fit properly. Seems like a little thing but it's one less hassle in my daily routine. I really am impressed with the thicker quality of the trash bags and also the quality of the trash container. How can one get enthusiastic about these bin liners - well when they are five star perfection anyone can. Perfect fit, thick, durable. Great! I have spent years not having a bin, choosing instead to just fill a bag and put straight into the dustbin after each meal because I've always thought kitchen bins were either too small and not worth having for our family of 5, or too ugly. However, saw an article on Simplehuman bins, then read reviews and ordered one. It arrived with some bin liners and from the first use I was hooked. Liners fit perfectly, keeping the inside of bin clean allowing for the full capacity of the bin to be filled. Liners also very easy to change. Never thought I would be found writing a review and praising a bin and liner. OK these bags do cost a bit more than your cheaper supermarket bags. But for us it is worthwhile as they are so robust and convenient to use. I'd had my SimpleHuman trash can for years before i finally bought the custom-fit liners. Oh, wow, so very worth the money! They fit like a dream. They're sturdy and stand up to a shocking amount of abuse. I am very happy with my purchase and plan to continue buying them. Effective and tidy are good adjectives for the Simple Human can liners and can. Nice design work, good quality. Job well done folks! The liners and the can are fabulous! Thanks. I love my trash cans and trash bags. The bags fit the cans to a "t". I bought two of the trash cans and now have order my second round of trash bags. Love! Love! Before using these bags l was fed up with bags that did not fit my bin and/or bags that split. Simple human bags are strong and well made. they're the best!!!! the thickness of these bags make them super durable and can hold a lot of weight. no need to worry about tears or double bagging. Fabulous bags! Fit well, very strong, and taller than the bags I used in the past for the other trash can that was recently retired. Great product!! Very good simple human bags and a good price. Fit perfect, very strong.............. Great product. You get what you pay for. Liners are easy, cost effective and convenient to order on line. Love the recepticle too. Love these liners. Have two sizes--one large and one quite small, and both fit perfectly. Had an issue with one pack of the large liners I got not fitting correctly, but your customer service addressed it right away, sent me a new pack and all is well. Will be ordering again soon when I'm about to run out. Nice, when they're the right size. I really like these bags, but that's only when you get the right size. My recent purchase of these has all the correct codes and size on the bag, but they're too big and don't have a snug fit at the top of the can. I contacted simplehuman and they sent more of the same. It's like they increased the bag size so now it no longer fits as it used too. Great - although costly, they are easy to fit and strong to get out without ripping. Good product, quick delivery but a bit expensive. Finally we have a bin and liner that is stress free and so easy to use. The electric opening bin is so clean, hygienic and easy. The liners are really strong and fit perfectly, and although they cost a touch more than supermarket ones, they fit perfectly, don't burst open when you pull them out, they hold more rubbish so you actually use less than others that are flimsy. Wish I had bought this system years agoo. I found them very fit for purpose although a little expensive ,all in all a good product. There are very few household items that I will go out of my way to order- usually if I can't find it at my "usual haunts", I don't buy it. Except these! I have a small kitchen, for which I purposely bought the waste can. Fits perfectly, adds to the decor, and is used a lot. I love that these bags are a perfect fit, allowing the lid to close properly and I love that they are as heavy as they are. Merci de vos commentaires positives sur nos produits. Quelqu'un de notre service client sera en contact avec vous en concernant votre livraison. The Code M custom-fit can liner is far and away the best liner I have used. It fits exactly in the interior can and does not bunch up when the can is inserted into the exterior can. It is easily removed when full, and the venting in the bottom of the interior can prevents vacuum sealing as happens in other cans. Excellent quality bags. Does the job well. My only other comment is to say I think they are expensive for a general plastic product. This liner fits perfectly with our new trash can. We tried regular store bought brands and they worked, but not well. The small increase in price has defintilely been worth it. The right sack for our container. Eh bien je n'en ai pas: J'ADORE MA POUBELLE et SES SACS POUBELLE, qui sont chics vêtus de blanc, résistants et invisibles! M Liners - Great Fit! Great fit for the can, makes it easy! I am at a loss to under stand why every one wants a review for every thing purchased, i.e. garbage bags. I purchased a box of liners for my garbage container and they do exactly what a liner should do. They keep my garbage container clean and allow a convenient way to dispose of garbage. These bags are the ones suggested for my garbage can and fit well. I appreciate the timeliness they arrive in. We've had our Simplehuman trashcan for years now. It is the 1st trashcan that we have not switched out with a different one. The liners are great! Never has the liners leaked or torn when full and taking them out to the big trashcan. Love these wonderful bags!! They fit great, close wonderfully and never break!! The bags have never split or been punctured. I do like the boxed product over the bagged one I just received. I love the custom fit liners we bought for out Simplehuman can. they fit perfectly!!! the only thing i could wish for would be some kind of retro-fitting liner holder for my can. the later built cans have a nice one on the back of the cans where you pull a new liner thru a whole inside the can. The custom fit really makes a difference. There is no outside overhang to see and you can really over stuff these bags. They are more expensive, but hold a lot more too without the unsightly bag wrecking the appearance. Worth every penny. You just cannot understand what you are missing until you try these can liners - they are so strong and fit perfect! While they are more expensive than those sold in stores, they are well worth the price. They don't puncture, stretch or leak, are easy to wrap around the can so that they don't slide down into the can when something heavier is "dropped" into the bag, and are easy to remove and close. All-in-all, good value for the price. I found the liners to be exactly as advertised. Service and shipping was exceptional. Love how they fit and the strength of the liner - never had a messy leak as with inferior liners. Bags Fit Like A Glove !! The can and bags fit exactly like they are supposed too!! Don't bother with any other liners! These are perfect fit, sturdy and I use fewer, overall. Custom fit and smelling nice!! Strong, a perfect fit. Never fall in and strong tie straps when it's time to dispose of them. Plus a reasonable price for such a high quality garbage bag. I opened my package as usual and the first batch I pulled out was defective. I admit I should have called you before now, but have been busy. One side is not attached so the string pulls out and does not close at the top. I love these liners and hope this is the last batch like that. Otherwise, I really like this product and will continue to order it. Thank you for your feedback. A customer support representative has contacted you to provide further assistance. parfaite taille et qualité. Bien attaché et caché. Have used the Bin and Binliners for a few years now and will not change, they never split which is just brilliant. Many thanks for your good quality products. Great product and was delivered on time. The bags are designed and fit in the type of can that I have and they have always worked well. Near perfect fit with tough plastic that resists tears and rupture. Lasting fragrance as a plus. Thank you for your feedback. A product specialist has reached out to you to provide further assistance. I love the trash can...never bought an expensive trash can. I have mixed feelings about the liners. They fit well and seem sturdy, but have had problems with the liners leaking. LIner's are not cheap either, for the price of liner's, none of them should leak. The trash bags from Walmart are a lot cheaper. I use them for a trash can in my garage and have had less of a leakage problem. Maybe a bad batch of bags, I don't know...again, I love the trash can and I am glad I bought it! Thank you for your feedback. We apologize for any difficulties you are experiencing. It sounds like you may have received a faulty batch, as the liners should not be leaking. A customer support agent has reached out to you to provide further assistance. Love them! So easy to order.. I love that they never slip & holds so much garbage!! I purchased a trash can and custom fit can liners and I could be happier with this purchase! These products are well-designed, functional and nicely built! Thanks. We purchased a stainless steel trash can and we absolutely love it All fingerprints wipe right off along with any other marks. We purchase the custom bag liners and the price is reasonable and we receive them promptly. We are extremely happy with your products! I use the M liner because it fits my can perfectly. And these things are tough. Out of an entire box, only one tore. Surprised the heck out of me. Your bags are great. I had broken glass in the one that tore. I have never had better quality with trash bags. I love these bags, they never tear and I really stuff them full. They always fit and much more economical than the ones you buy at Walmart, Target, or the grocery store. Everything that I have bought from Simple Human is 100% great. I plan on buying more items as I can. Keep up the good work! I purchased a package of can liners and the tabs to close the liners malfunctioned resulting in torn bags when I tried t o close them. the bags were promptly & curteosly replaced with a new bag. This particular shipment is very snug. Very difficult fit on the can. Thank you for your feedback. Our custom fit liners are designed for a snug, tailored fit so they stay neatly hidden beneath the lid — no messy bunching or slipping. If you feel the liner is not fitting properly, please call us at 877-988-7770 (Mon-Fri 8am-5pm PST), and a customer support agent will be happy to assist you. Trash can liners fit the cans they are designed for. They also appear strong enough to do the job. Fits Perfectly and delivery was a cinch! As always ... these are the best liners for my trashcan. Love the fact that I've yet to have to clean out the plastic liner because the bag fell in and not seeing the liner under the lid is a bonus! Oh yeah and having the 5th (or so) liner have a sticker alerting you that you're running low is awesome!!! Delivery was fast, simple and inexpensive! Thanks Simplehuman! the bags are great - strong and easy to put in place...i like them much better than the store brand (Glad) i have been using for years. I like that they fit but after ordering I found that other cheaper brand fit but not as well. We love this garbage can for the kitchen and its sleek design; however, when we ordered the 200 pack of custom-fit can liners, we found that we were struggling to get the liners to fit properly. They are a bit too small, so you have to stretch the liner around the rim of the can. We were disappointed, since we've always had good experiences with the Simple Human product, even though they are mor expensive than other products. Thank you for your feedback. Our custom fit liners are designed for a snug, tailored fit so they stay neatly hidden beneath the lid — no messy bunching or slipping. A customer service agent will be in touch with you to further assist you. perfect fit! I order this about once a year and I am always satisfied 100%. You guys always get it right. Thank you! I have been using these liners for 4 years. They are sturdy. Never had a problem with leaking or tearing. Price is high though worth it. Especially when bought in bulk. Fits the SH Can I purchased perfectly; get the entire use of the bag due to the snug fit; easy to take off the SH garbage can I purchased, and the value for bulk purchasing was worth it. Bags don't stick together like those purchased on a 'roll" , making it easier to quickly change out the bag. Sturdy and items don't poke through the bag when dispensing to the garbage cans outside our home. This is one bag that lives up to what is advertised, fits perfect in the trash can, and very strong, no matter how full the handle doesn't pull out or tear. Not that it really matters, but you get 10 bags of 20. It's a store display box. The liners are very tight to get on and off the bin in spite of being the correct size, however, this is a very small matter. They are very strong and don't leak and I will buy more in the future as they are the best liners I have ever used. Love my new simplehuman bin too it's perfect. I have had my cool SimpleHuman kitchen trash can for several years, and stocked up with a few hundred trash can liners at the same time. Panic when I ran out and tried to find the size M replacement liners in my town without any success. Ordered from SimpleHuman and they arrived quickly, thank goodness. Had to use Glad Bags for a few days. Ugh! The SimpleHuman liners are designed and shaped for my particular trash can, which has a very handy foot pedal, and these very sturdy bags tuck into convenient little grooves for a good, tight fit that does not slip down into the can as the Glad Bags do. These SimpleHuman Liners are heavy duty, and I have never had one break open, as have other brands. I liked this system so much I bought one for my only daughter (and tons of liners) when she moved into her first apartment. Love the way the trash can looks...stainless steel and so attractive...and these liners are great! I really recommend this product!! I really like this trash can liner stays in place and is durable. It does not puncture when pulling out of trash can. This bag is very strong. You can put a lot in to it. We have been ordering these liners for years. They are very strong and fit the can perfectly. We will continue to keep these stocked at our house. there is no odor in the trash can no matter how much trash I put into the bag. I love the size and the bag fits perfect. Seriously stronger than what we used before buying a simplehuman garbage can (Glad)...emptying trash is much less of a hassle now :-) Definitely worth buying the custom fit bags. I have been using this product for 2 years now and NEVER had a problem with leaks and feel totally comfident with it's strength when using them. Tough Bags! I love it! Other than the stainless steel can, the bags are, by far, my most favorite. They are durable and easy to handle when they are full and tied. Very strong trash bags and fit the trash can nicely. This is the only bag that fits for the simplhuman type M trash liner bags. Any other brand from the store will not work! It is a perfect fit. The only area that needs improvement is the drawstring tying area still has a lot of looseness to it. It does not close tightly, which can be a concern for odor. Simplehuman home waste handling products are excellent and fit our daily needs perfectly. 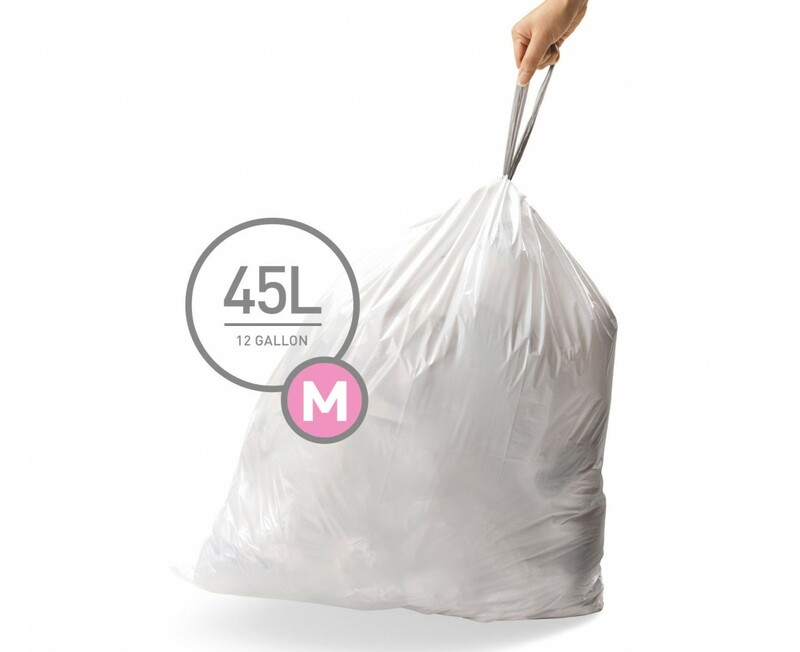 The code M custom fit can liners along with the size M can is a clean and neat way to handle household garbage. The trash bags fit very well. They are durable and strong. There is so much about the Simplehuman trashcan that lives in my kitchen I cannot possibly name a single favorite thing about it. It is, in fact, the holistic perfection of it that makes it a pleasure to approach. I use it several times per day, and each time quietly congratulate myself on my good sense and taste. The size is perfect for my purposes, it is exceedingly well constructed, and looks like it had to be there. Anything else now would look like - well, like a trash can. This is quite something else, yet a trashcan as well. It adds to the overall look of the place instead of appearing as the Necessary Evil I always lived with. I kinda love it. It is a great custom fit for our trash can. The cost was a concern but so glad we bought it. They fit so well in the new can and NO MESS. Sorry we didn't know about the product sooner. Looking for more products to buy from Simplehuman. Great looking and very well made. Nice and sleek.Love the self-closing feature. A great purchase and the bags fit great. I recently bought a Simplehuman trash can (I absolutely love it) and tried regular bags in it, which were OK. Then I tried the Simplehuman bags. They fit so well and are so extremely strong, I won't buy anything else. Good design, convient to locate flush with island in kitchen area. Liners are tougher than any that you can purchase retail. My husband bought us a new trash can and samples of the Simplehuman brand were inside. I was skeptical at first since they were custom and thought they would be way more expensive than other traditional trash bags. These do not compare. They are great - heavy duty - hold lots - fit perfectly. I would recommend to anyone and plan to continue purchasing them. wonderful product, stands up to anything and everything. very happy with trash can and liners. The liners simply fit perfectly! And in bulk are quite a deal. (Simplehuman site is easy to use and has the best prices). Great bag - it fits can well, doesn't tear, and is easy to handle. One of the best things about these bags is that they fit perfectly in the trash can. No more sloppy looking trash cans. They are stronger than regular bags and I recommend them. We use these bags every day. They fit the Simple Human trash can and have always held up without tearing. I first purchased these at Marshalls. That box was identical to my recent purchase, only those bags were also biodegradable. I thought this box was too, until it arrived. I wont pay 18 for them again unless they are biodegradeable type. Otherwise, I love the box and size of the bags. I have used these liners for four(4) years. they are very durable. They do not split and the ties don't break when taking them to the dumpster. I would not use any others if they paid me. Have had this trash can for 2 years - love it, it fits at the end of my kitchen island - I always buy the bags that fit this model, they are excellant quality and fit great. Perfect fit. Very strong bag with no hassle. No air in the can either. It's attractive. I have it in my kitchen and use it daily. It was a gigt to us after we moved back into our home after Katrina wiped us out. The bags are sturdy and the can is durable. We have had it for 5 years and it looks like new even though it gets a daily workout here. I love the trash liners because they fit perfectly, don't show on the outside and also easy to remove. Keep it up! We love this trash can!! We have been enjoying our simple human trash can for a while now and I have been ordering the liners from superhuman. This is the best way to handle trash in your home. The lid closes softly on its own. We recently redid out kitchen and the can goes so well with our other stainless appliances. Of course, you step on the pedal because hands are full. We are totally pleased with superhuman products. They are the best!! My husband primarily empties and he likes the can and liners very much. It's a garbage bag folks we don't care about looks. I only use the simple human bags in my simple human can because: They fit great! They are heavy enough and well constructed. I have had the can for over 2 years and only once have i discovered a leak. It happened because someone put broken glass in the can without first wrapping it. Thus a hole. I appreciate that I can order replacement bags on line and it only take a few days for them to arrive. I always order enough so I don't have to pay shipping. I really love the way the trash bags do not show when the lid is down. All you see is the stainless can. I also love the amount of trash that they hold. I have the semi round can and just love it. No more rubber trash cans for me. Thank you. These are the absolute best trash bags. They fit perfectly, are strong, and really don't cost much more than grocery store bags. The liners fit perfectly and are very sturdy. I usually buy several boxes at a time to get free shipping. Well, what can I say? This garbage bag/liner is a shoo-in for fit, performance & styling. Admittedly it does only one thing, but perfectly so! I really like the look! I have had mine for over two years and never had a problem with any part of the trash can, which is a first. I have tried others and the Simpehuman is by far the most durable. Great fit for bags, large & spacious, pleasing to the eye, very sturdy, & something I use on a daily basis. We bought the semi-circle trash can for the kitchen (love it! ), but regular trash bags were ill fitting. Husband suggested we try ordering these custom fit bags, it was a great suggestion. These bags fit perfectly and are worth the extra pennies. The trash can liner is much more durable than others that you can buy in stores. It holds more trash than other liners, and fits perfectly for the Simplehuman trash can. I know it seems crazy to spend $100 on trash bags (particularly in this economy) but they fit perfectly and even my husband is able to put them in without leaving gaps for trash to fall down the side of the can. Will definitely buy more when these 400 run out! I bought a large amount of these bags so I wouldn't have to think about garbage bags for awhile. They are really strong bags so I can pack them well and don't have to worry about leaks. They fit my garbage can perfectly! I do like them - they are more expensive than many garbage liners that you can buy - and I wish they had an odor control choice bag but I would buy them again and would recommend them to people who can pay the extra coin. Bought the trash can at Target with 4 free liners. LOVED them. Ordered 50 more from Simple Human. This trash can is worth it. Holds a weeks'worth and the bags fit just perfectly. However, I paid over $17.00 for these bags and found them the next day at TJ Maxx on an end cap for $5.00...same bag number. So I bought these. I have about 100 bags, but will use them eventually. My trash can came with a dent in the front...couldn't have been in the back, but I needed it so didn't send it back. I use the product daily. Simple,sanitary,easy to use and takes the trouble out of garbage disposal activities.The design is perfect for my home decor.Very durable & stylish! It makes my job easy.Best product on the market! We like the space of the can and the durable, stylish design. The stainless look co ordinates with our stove and refrigerator. The liners are easy to use and they do not break. Bags that actually fit the can! These bags really work. I don't why someone else hasn't done this before, but offerring a bag that actually was designed to fit the specific can is a no-brainer. Great job! These are the only lines I use for my can. They are great quality and have a strong hold. We have never had one rip. Finally, trash bags that actually fit the trash can. These bags are well constructed, sturdy,and strong. I really like this product and will order more. I will also buy more Simple Human products and liners. Perfectly fits my Simplehuman trash container. Good quality tough bags. I use this in my Simple Human trash can, red and black. It fits perfectly and is very endurable. I love lit. Of all the kitchen trash cans and liners I've ever owned, Simple Human is simply the best. No other can has ever worked as smoothly, and no other liner has ever fit so well, and been so extra strong. Simple Human; more like Super Human! This bag fits the garbage can great..it is a good and sturdy plastic that holds trash well and does not bust! Impressive! However...we have had the gray plastic pull around the top break several times while trying to tie it closed. It would be nice if that was a little more durable. These bags are excellent quality. They fit into my SimpleHuman trash can perfectly! The bags cinch up perfectly, maintain their shape and are extremely easy to handle. I am addicted to these bags! I've had my wonderful simplehuman trashcan for more then 5 years and love it. Unfortunately, there must have been a change in the manufacturing process for the liners, because they no longer fit. I've been buying the same code M liners for years and have never had a problem. Now the tops are so tight that even a very strong friend of mine can't get the top band over the rim of the can liner. It's very frustrating because I bought 2 cases of the bags at one time. I'm going to be struggling with them for the next year. I have purchasd countless trash cans in the past that didn't last. I love the simplehuman trash can and bags. These are simply the best trash can liners made. After 6+ months of using them, there have been no leaks or tears. And they fit perfectly! Best Liner on the market!! I love my simple human can because my big dogs cannot open it. I love the bags because they fit the can perfectly, and they are east to close. Fits the can perfectly. Very durable - no leakage or tearing so far. We are very satisfied with the pedal operated trash bin that we purchased from Simple Human last year. We use this product every day. The bin is appealing in design, and easy to clean with it's special exterior stainless steel finish. The designed to fit trash bags are also excellent, and are of a good size, and they are strong, holding up well when full. We also are appreciative that we can order a large supply of the perfectly fitted trash bag liners from Simple Human, and receive polite and prompt service. Best trash bags - ever!! They don't leak and very durable. we use it everyday, they hold alot and no problems with over stuffing. very well made, use it every day, looks good and a perfect size. Liners as they should be ! M size (45 Litre)....Strong.... and they smell nice ! Having liners that fit our can perfectly makes our can system work so well. Great product! These bin liners are great as they fit the bin perfectly and rarely tear - good, stong plastic and good quality. I also like the way they dispense from the packet. Besides the can I bought 400 bags to fit it. I have opened ten packages of bags and have found bad bags melted together in most. Can you contact me or replace approx. 50 bags that were not usable. Quality control on these should be checked. Otherwise I am very pleased with your products. Phone is 940 733-1547. Thanks. We're sorry for your experience; a Customer Service Representative has contacted you to assist you with your issue. The liners fit superbly well and make the bin look much better. they are tough and strong - a great product. No complaints. Drawstring strong & never tears plastic. Durable and never leaks. A perfect fit in my trash can. Size matters (in garbage bags)! Too big, too small? Nope, just right! I buy several boxes of liners at the time. Kinda pricey but well worth it. I have the half round simplehuman can and love the way these bags fit. This is by far the best bags I ever used. Excellent. This is the only place I buy my bags. They are strong and worth the money. Love my can! The Size "M" bag is a perfect fit for the semi-round trash can. You do not have to struggle when changing bags. We use one bag a week in the kitchen. It is strong enough for the biggest load and is not visible when the lid is closed. This trash can has lasted longer than any I've ever owned. The bags fit nicely, and lift right out as long as you don't overstuff. The stainless steel cleans up nice and looks new after each cleaning. The foot pedal works great, too! These bin liners do exactly what they should, they fit the bin they are designed for and are strong enough not to tear. Bulk buy for best value. After numerous other kitchen bins over the years, all of which were disappointing - either nice looking, but impractical (difficult to clean chrome etc) or cheap and broke easily (plastic) I was thrilled with my purchase of Simply Human bin. The LINERS seemed so expensive compared to Supermarket ones, but I shall definitely continue to purchase them - so strong and practical - such a change not to be left with 2 teabags and pizza crusts spilling onto the floor! A top quality product if can be afforded. When we bought our simple Human Trash Can, it came with a few liners and my husband and I liked them so much, we bought a bunch. They fit perfect, very strong and keeps odors from stinking up the can. Will definitely buy again! only need to change the bag once a week. fits well in the simple human trash can. liners are so strong we can really stuff them with no breaking of liner. Extremely well made. We love the trash can -- easy to open and close and it,s also so beautiful. these bags do the trick for me. they fit perfectly and are quality bags, have never seen them tear like the other brands. These are the best trash bags, and containers, that I've ever had. Never a rip or tear. Sturdy and strong. Blows away all other brands. The can liners/bags fit the can perfectly. Got the half moon trash can as a gift. It functions as a trash can and more importantly to my wife, it actually looks good in the kitchen. The trash bags from Simplehuman obviously fit perfectly and I did try to use other less expensive brands, but they were either not "deep" enough or not "wide" enough. Considering that we recycle probably 40% of our normal trash, we thought the increase in cost to be negligable, since we use fewer bags. You just don't think much about a trash can, that is, until you find one that is actually handy to use! This one is "handsfree" and I love it! These bags fit my simplehuman trash can perfectly. i love the price of these bags. We love the size,it is perfect...the bags seem to be pretty durable, no complaints. Easy to use and very well constructed. I could sell these bags as there is nothing that is not superior quality. I have told so many people about them The stainless steel is much better than my refrigerator. Cleans easy. 5 stars all the way! It's a perfect fit for the trash can. Easy to replace and a snap to get out of the can. I love it! These liners fit perfectly and are a good weight to hold many things. They don't leak either. Great trash bags, strong and biodegradeable. Can't find them at the local stores that carry the trash can, so I had to order them online. i bought enough for 1 year so this isn't a major issue at all. Love the bulk price...I buy the 400 count and use them at home an at the office, thus changing them everyday. Size works great, but they fit a little tighter than they used to making them prone to splitting if I pull the liner onto the can seam side first. I avoid this problem by pulling them on tab/handle side first. Thanks for your review. The liners are built with extra thick construction, so they shouldn't be splitting. Our customer service team has contacted you to gather more information and propose a solution. The trash liners are heavy duty, have built in ties, and the size fits perfectly into the waste container. You do not even see the trash liner - just a nice stainless steel trash can!!! We ordered more trash can liners because these fit the simple human trash can we have. They fit really well and don't slip down into the can. They are also durable. These bags fit perfectly into the container. They also are designed to fill well and stay in place inside the can. These liners fit the can perfectly. They're very easy to change and they are completely hidden when the lid is closed on the can. Finally a bag that actually is designed to fit in the garbage can. Sometimes it is the little things that make life better, and not seeing the "flaps" of a garbage bag is one of those items for me. Strong, fits the can perfectly and holds a lot of trash. This pproduct has worked great for our household. We use it daily and the size it perfect. It was made well. I purchased a 40L Simple Human Stainless Trash Can from Home Depot but they didn't carry the trash liners. I tried some other liners but they didn't fit very good so I went on-line and purchased the Simple Human 45L-code M-Liners and they fit perfect. They are stong and easy to use--excellent product! Perfect fit and strong materials for use with SH half-moon trash receptacle. They are very durable and fit perfectly in the can. Haven't had any break on me, and I usually have at least one pointy sharp thing in the garbage every time. I'm impressed. They fit the can perfectly. They are very strong. AND very easy to use. Simple human replacement bags are sized perfectly for my trash can - no ripping, tearing, or trash leaking down the sides. Easy to install and remove - makes changing bags simple and easy! Containers design & functionality is outstanding! The designed bags for the containers were perfect. Bags hold up and are economical.I use this product 7-8 times a day. I especially like the durability and classy looks of the product. I like the bags. I wish they had a biodegradable version. It fits the bin well. I always use it, it's durable, and it's well-hidden from sight. I think it would be beneficial to add an odor deterrant of some type, or fragranced liners. Excellent quality for trashcan refills, great size and perfectly made. Bags fit well and have had no problems with tearing. Good product! These bags fit the Simplehuman perfectly!! They dont leak and are strong as nails!! I will use nothing but these. I purchased our simplehuman semi circular trash can at a Homegoods store. It came with 3 liners. I ordered 50 additional from simplehuman so that we are covered for one year. The fit is perfect and I am very happy with the product and the service I received. I would highly recommend simplehuman. This was the best deal I found for this product. Quality product, an efficient way to manage home refuse. These bags fit our can best and it is very good to have a year's supply without having to go buy more. There is no comparable product in local stores. I purchased the EXPENSIVE bags to use with my simplehuman trash can, because the generic trash can liners did not fit. Surprise! Neither do the simplehuman ones made for the size can I own. I use one daily and it is a struggle to install it. It very often pops off a corner, resulting in trash falling into the container, rather than the can. Very poor design and at a rather elevated price point as well! While I'm at it, I would like to comment about the trash can as well. It weighs a ton! I have a similar Brabantia in another home and it is a far, far better design. The simplehuman can requires brute strength to move the [empty] can across the kitchen floor. Oh, and by the way, the lid doesn't open/close easily to the touch as it should (not at all like the Brabantia one). But the bags are strong. Great product for price--very value positive!!!! no store carries this size--so a great opportunity. Have four, use every day. Size is great, bags fit well, excellent construction, looks great. Fitted trash can liners are a perfect fit in the can. Strong, Durable plastic. Haven't had any problems with bags tearing, splitting or breaking. I about fell over when my frugal husband came home from a home improvement store with a new stainless steel trash bin that he purchased for about $100! We keep it in our basement beside our sink where we wash out our latex paint brushes. The wastecan is hands-free and paid for itself in the first 3 months we had it. Thank you for making such a wonderful product! This trash can is easy to clean, looks sleek and is very durable. I particularly like the black top instead of stainless since it doesn't show fingerprints. durable bags that fit my simplehuman trashcan as if they were made for it - oh wait, they were! The bag is not the one I first bought for my half round garbage can, so I was slightly skeptical that it would fit as well as the first ones we received, but boy was I wrong. They are just as strong and fit like a glove. The ties are strong as well. No breaking, no spillage. The bag is a winner on all counts. Thanks. This is truly a great bag. It is better than the strongest glad bag! Very please with the results. These liners cost a bit more each than others, but are worth every penny, because of the extra strength and ease of use and tying for disposal. finally a bag that doesn't hang over the edges and look messy! The bags are the perfect fit and the right price! The bags are strong, neatly fitting and sealing the cannister and thereby maintaining it clean. The bag's biodegradability although it is plastic, is a big asset from my perspective. Had this trash can for two years now and I love it. The bags I order thru simplehuman and they are easy to install in the can and they hold a lot of trash. It's sleek looking, easy, keeps odors in and I wouldn't use any other can. I am on my second order of simplehuman liners. They are a perfect fit and a really durable liner. Time between ordering and receiving was exceptional! I purchase the liners for my trash can directly from simplehuman because of the fit and quality. I haven't had a liner leak yet! The liners are made product specific for the kitchen trash can that I purchased so they fit like a glove. They don't even show when installed. I always reorder from Simplehuman website for prompt service. The trash bags really don't break or get holes in them. I love that they fit so neatly in the trash can. I have had the simplehuman trash can for 4 years and wouldn'd think of using anything else. Bags are great, very strong and easy to use. good bags make it easier to deal with trash and appearance. We saw the 40 Liter trash can made by Simple Human at a friends house. I inquired as to where they got it. I went to the store to look at them and was surprised at the higher than expected cost. I purchased it anyway and have learned that it is worth every penny. I even ordered the bags for it online when I got home. The receptacle and bag combination has simplified the entire process more than I ever imagined. Not only would I recommend it to friends and family, I've purchased another one (With Bags) for my best friend. This was the best purchase I've made in a long time. Get yours TODAY, you won't regret it at all. These liners make them easy to replace and fit the trash can perfectly. I recommend this type of trash can for kitchen use. You don't have to smell the trash when using this system. We have a Luxury Bed and Breakfast (Legacy Suite on Main )and the trash can is the right size and attractive enough to leave out next to our mini bar. The liners are such a perfect fit. Great Job !!! Shopping is easy on the web site and the product is superior. This trash can is extremely nice. It has a nice shape, is easy to empty, easy to use, just step on the pedal and most of all it shows NO FINGERPRINTS! I am a babysitter with many kids. They are constantly touching it. NO FINGERPRINTS!!! These bags fit the can great, stay up no matter how full they get, come out and close easily. What more can one want in a trash can bag? Superb liner, better than any I have tried. I bought a new trash can at the Container Store to replace my old one which was still in good condition except for the white paint. I also ordered the liners which are excellent, leak-proof completely. love the bags. perfect fit for just a little more. After trying liners of varying quality and price points, I finally ordered straight from the source. There's no doubt about it -- these are the best. 1) They fit perfectly, 2) they're strong and 3) they're easy to use. This Container is absolutely great! The only thing is that the lid comes off of it's hinges too easily. Other than that it's wonderfully large! I really love the trash bags, they fit the can so well and they are well made. I get compliments on the trash can that I ordered these bags for all the time both are a great in my kitchen! My kitchen has a very modern design with all stainless steel appliances. This trash can fits in great with the look of my kitchen. I highly recommend the simplehuman trash bags, they fit inside perfectly and cannot be seen from the outside of the can. These garbage bags fit my half-round can very well. They are sturdy and can handle big loads! Like the can very much. Cannot live without the liners though. These are very good trash liners. They fit the cans they are made for perfectly. We have a simple human trash can and use the simple human bags. We have tried other (cheaper) bags and they just do not do the job as well! I purchased trash bags for a semi-round trash can. I really liked the trash can, but found regular trash bags were a bit too large, making it difficult to replace them. The trash bags I purchased from Simplehuman are perfect and extremely easy to use. Placing the order was simple, and I received my order very quickly. I am very pleased, and I will continue to purchase these trash bags from Simplehuman's web site. This is my 3rd refill. Costs more than other plastic trash bags, but the stainless trash pail in the kitchen and bags make life easier. bags fit great and they are good and thick. Cost is high :( Ground (least expensive) shipping from west coast took too long. Why not get a ship loc. on the East coast also?